Met up with 3 other families and was part of the game convention. The cruise was nothing special, too many people for the staff. Long waits for drinks little or no service from staff and the wait for all restaurants was unacceptable, 30-60 minutes before waiters and then 30-60 minutes before food arrived. On top of that our stop at the cay was canceled due to high waves. You would think a company as big as this would have a dock. Built so your customers could enjoy the private island you own So we spent two days cruising up and down the Florida coast. I’ve done several cruises and won’t be back in Norwegian . Then the debarkation was a complete and utter unorganized mess. Lines wrapped around the deck no crew to direct or ensure lines were organized. Overall poor experience if it had been my first cruise I would probably never cruise again . I will pay the premium going forward and cruise on Holland America. Met up with 3 other families and was part of the game convention. The cruise was nothing special, too many people for the staff. Long waits for drinks little or no service from staff and the wait for all restaurants was unacceptable, 30-60 minutes before waiters and then 30-60 minutes before food arrived. So we spent two days cruising up and down the Florida coast. 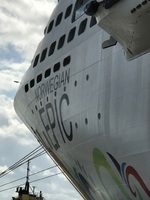 I’ve done several cruises and won’t be back in Norwegian . Then the debarkation was a complete and utter unorganized mess. Lines wrapped around the deck no crew to direct or ensure lines were organized. Overall poor experience if it had been my first cruise I would probably never cruise again . I will pay the premium going forward and cruise on Holland America.